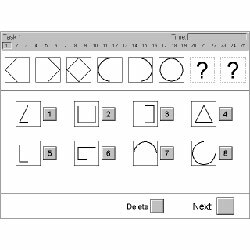 Nonverbal logical thinking, as it is tested here, is fundamental for all occupations where abstract information is being processed. Main areas of application: aptitude diagnostics in the performance area, industrial and organizational psychology, consulting regarding school, college, and career decisions. The test is of inductive nature, i.e. aims at measuring the ability to derive a general rule from a specific case. FOLO belongs to the factor Reasoning ability (R). Reasoning ability is regarded as a fundamental dimension in all recognized models of intelligence (also in the g- factor theory). The various definitions of Reasoning ability encompass a broad spectrum: abstract thinking, relational thinking, analytical reasoning, sound judgment, etc. Reasoning ability is often considered the real core of intelligence. A series of six figures, based on a specific logical system, is presented. The respondent has to determine which two figures out of eight options represent a meaningful continuation of the series. There is one test form consisting of 25 items. Each correct answer is given a point. The number of correctly solved items constitutes the overall performance. The split-half reliability coefficients vary between r =0.89 and 0.91 for respondents with different educational levels. The psychological validity is evident - the respondents think immediately of "logical thinking, analytical reasoning". The logical validity is given by the operational definition of "Inductive reasoning". Content validity has been proven through factor-analyses. Prognostic validity has been demonstrated for occupations demanding, among other things, a high degree of reasoning ability. Norms of a sample of 1147 Swedish adults are available. They are also available according to education level and age. Additionally there are norms of 192 Austrian adults, which are also available according to education level and age. The testing time is 12 minutes. Add approximately three minutes for instructions and solving the practice items.